Resource Description: Many low- and middle-income countries have experienced strong economic growth in recent years, resulting in increased capacity for social sector spending. Net energy importers have further benefited from falling fossil fuel prices. At the same time donors are preparing to scale back development assistance, including support for global health initiatives. Responding to a lack of practical guidance on how countries can mobilize more domestic resources for the health sector, the Health Finance and Governance (HFG) project organized a series of joint learning workshops to promote knowledge exchange, share new and existing resources, and support countries in a DRM-for-health action planning process. 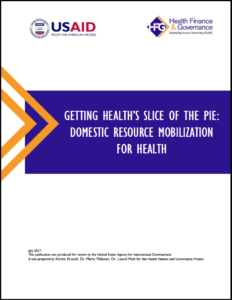 This report summarizes the workshop proceedings and outputs, and provides templates, links, and tips for countries endeavoring to sustain and accelerate progress toward health objectives through the mobilization of domestic resources.